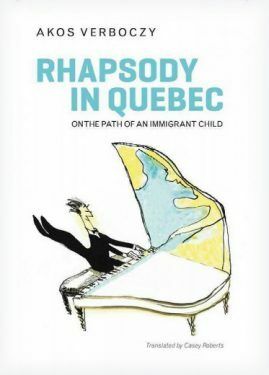 Akos Verboczy, Rhapsody in Quebec: On the Path of an Immigrant Child. Translated by Casey Roberts. Montreal: Baraka Books, 2017. 243 pages. 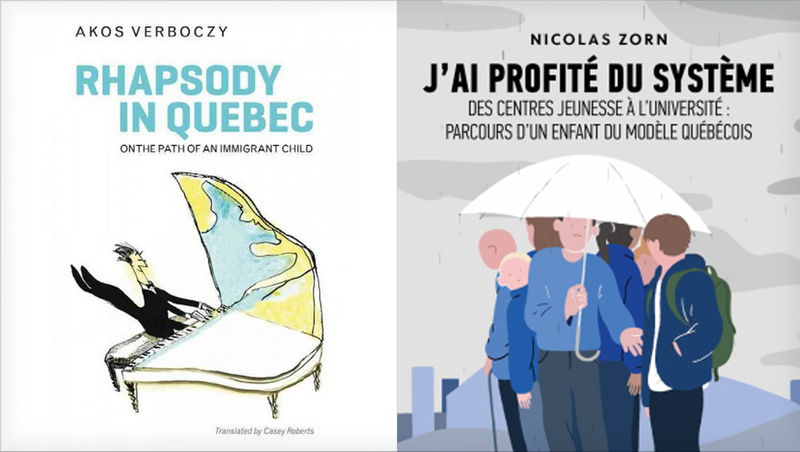 Nicolas Zorn, J’ai profité du système; des centres jeunesse à l’Université: Parcours d’un enfant du modèle québécois. Montreal: Éditions Somme toute, 2017. 240 pages. Anglophone immigrants are outsiders in the majority community, especially in nationalist circles. It is in the anglophone minority, reflecting a Canada that is open to them and to the diversity of their society, that they are most welcome. The Quebec public sector is a drain on taxpayer money; the services it provides are inefficient and ineffective, and serve the interests of the providers more than those receiving the services. Verboczy attacks the first myth on the basis of his experience. While he is of a very different generation, in certain ways his experience reflects my own. He was born in 1975 and came to Montreal at the age of 11 (I came at the age of four in 1951). We are both of eastern European (Hungarian and Polish) Jewish background (he is half Jewish, on his mother’s side), and grew up in the Côte-des-Neiges district on the other side (northwest) of Mount Royal from the city centre. Côte-des-Neiges, where I still live, is now even more of a multicultural bastion, with more than 100 languages spoken. Verboczy, like other Hungarians I have met, is a chauvinist when it comes to the culture of his nation of origin. He sees it as simply natural to take pride in one’s national culture and thus eminently reasonable for immigrants to be expected to open themselves to Quebec culture – as he has done, becoming a supporter of Quebec sovereignty. He has little sympathy for multiculturalism, which he sees as laced with political correctness. His experience has taught him, as he puts it, that if Quebecers will be Quebecers, everyone will benefit. The first part of the book is about growing up as in immigrant and Quebecer in Quebec in the last decade of the 20th century. It makes for entertaining reading, without really exploring the political dimensions of the integration process. The second part is more political. It tells in particular of his stint working for Diane de Courcy, Minister of Immigration in Pauline Marois’s short-lived Parti Québécois government. And several of the incidents remind me of the time, when, as an Anglo supporter of the PQ, I tried to promote dialogue between anglophones and the Lévesque government. He finds himself in the middle, trying to bring Quebec nationalists to a better understanding of the reality of the Neo-Québécois (sympathy goes only so far without understanding). At the same time, he has the harder job of trying to bring the Neo-Québécois to a better understanding of, if not sympathy with, Quebec nationalism. He argues from personal experience that the obstacle in the latter case is the leadership role that Anglo elites play in much of the Neo-Québécois community. Zorn’s story is a different one, though there is a Montreal multicultural reality here too, since his father was a unilingual American married to a French Canadian. He was born in 1984 in a middle-class family in Ville LaSalle, in the southwestern part of Montreal Island. His francophone identity was confirmed when he lost his father in a car accident at the age of eight. But the tragedy also led him to rebel against the society in which he found himself. 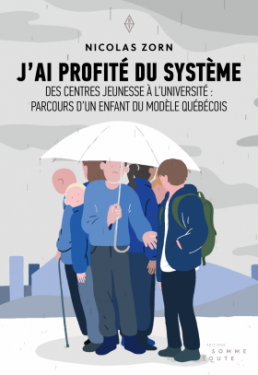 This book tells the story of the stages of his life during the next decade as a juvenile delinquent, of how he was treated by – and ultimately “profited” from – “the system.” As the story continues, it evolves into a wider defence of the sometimes-maligned Quebec welfare state, especially the Directeur de la Protection de la Jeunesse (DPJ), the agency mandated to look after the welfare of young people in trouble. The DPJ seldom gets the appreciation it deserves, he argues. Indeed, it is only when it fails that it gets public attention. And fail, on occasion, it must. (I know of a case where a complaint by the child of a coworker, which turned out to be false, made the life of the accused miserable for over a year and ultimately forced him to seek employment elsewhere.) Zorn’s book is a useful reminder that the DPJ’s insistence on placing the child’s welfare above all, which in his case amounted to a decade of efforts to bring him back into the community and mainstream educational institutions, can and does have beneficial effects. He helpfully assembles statistics on the various interventions (of more than 80,000 potential cases reported to it, the DPJ intervenes in 20,000-plus cases annually.) His main claim is that, more than elsewhere in North America, the process in Quebec focuses on the real needs of the child, investing sufficient resources to follow him or her (usually him) through the years. The final section of his book goes on to argue that the overall effect of the Quebec welfare state has been positive, stressing the lower levels of inequality attained in Quebec compared to elsewhere in North America. This section is based on his work with the Institut du Nouveau Monde (INM), where he organized a Strategic Rendez-Vous on social inequalities, bringing together experts and activists seeking to identify the values ​​and priorities of citizens’ action on social inequalities, and propose solutions. 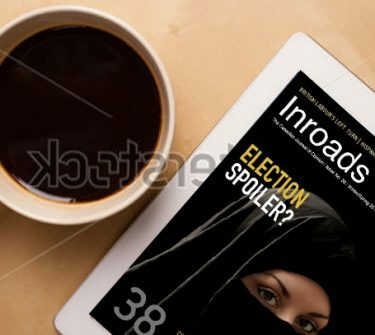 Over a two-year period, the INM released a number of accessible publications, organized dozens of activities and consulted 5,000 citizens from all over Quebec. Zorn assembled the results, combining citizen attitudes and scientific knowledge on social inequalities in Quebec. Zorn is now expanding his research in a PhD program at the Université de Montréal and will no doubt put it to good use for his community in the future. 1 Verboczy was organizer of a project called Électeurs en Herbe, setting up mock elections in many school cafeterias. Zorn organized the Strategic Rendez-Vous on social inequalities for the Institut du Nouveau Monde (INM).